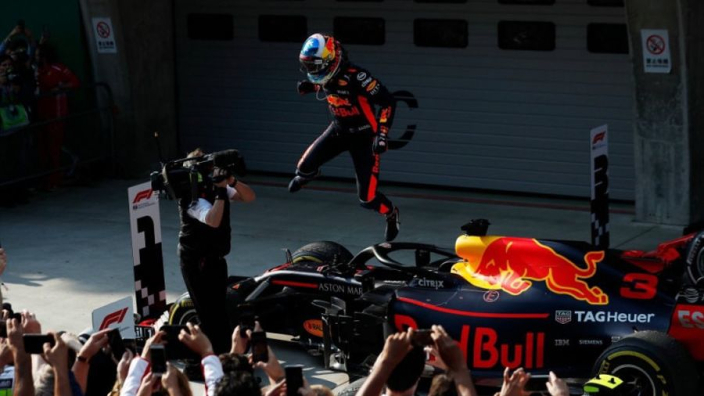 Daniel Ricciardo doesn't like doing it the easy way... Grand prix victory number six came in China this weekend after a pulse-raising race in Shanghai, which tipped the shared truths about Formula 1 in the hybrid era on their heads. It's lights out for Monday morning! Ricciardo almost didn't even make qualifying on Saturday after his turbo blew up in spectacular fashion. Just over 24 hours later, he'd taken a first victory of the season, drank champagne out of a shoe and all was right in the world of the Honeybadger! No doubt the highlight of Ricciardo's win was a laser-guided dive down the inside of the lead Mercedes of Valtteri Bottas. Ricciardo's reaction was typically Ricciardo: "Sometimes you just got to lick the stamp and send it!" Though not quite as special as his nine-place gain on the opening lap in Shanghai last year, Max Verstappen was once again swift off the line, moving up to P3, well ahead of Ricciardo. However, botched overtakes on Lewis Hamilton (for a second week in succession) and then a clip-turned-spin with Sebastian Vettel took victory and then a podium out of his hands. After approaching Vettel to apologise immediately after the race, the Dutchman held his hands up publicly for his mistake. Oh yeah... and Mercedes? Hamilton was absolutely nowhere all weekend and finished fourth, only thanks to Verstappen's time penalty for the Vettel incident. Bottas finished second after holding off Kimi Raikkonen, but the Silver Arrows' pace drop-off is of major concern to the champions.